How It Works: ZP-707 Motor Flush is used in both gasoline (petrol) and diesel engines. This product contains materials that will quickly remove surface gum, varnish and carbon. What makes this a superior product to others is Vacclaisocryptene (ZP). This is an intense pressure sub-surface lubricant that penetrates metal. Under operational heat it will sweat out and prevent further deposits and contamination from adhering to the metal surfaces. What To Expect: Within a few minutes engines that had been idling rough will smooth out. Acceleration will have improved and many will experience easier starting. After oil with Motor Flush is drained the ZP-700 Engine Oil Treatment will continue to ooze from the metal pores preventing deposits from reappearing. 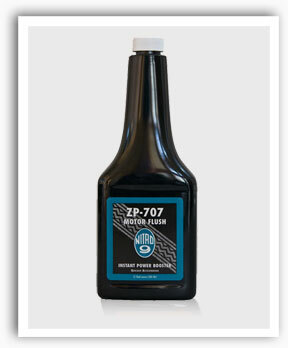 After using ZP-707 Motor Flush, treat the engine with ZP-700 Engine Oil Treatment. Treat engine with ZP-700 Engine Oil Treatment every 6,000 miles (10,000 kilometers) to keep engine clean and at peak performance. Directions: One 12-ounce (360ml) container will treat a 4 to 7 liter engine oil sump. Warm engine first. Turn off engine and apply ZP-707 Motor Flush to oil port and operate for at least 15 minutes. The materials in this product are not harmful to the metals or seals that make up an engine. If you feel the engine is heavily fouled, you may choose to run the ZP-707 Motor Flush longer. Directions For Large Diesel Engines: Treat oil sump at a ratio of 1:10 (one liter of Motor Flush to 10 liters engine oil). Run engine for 30 minutes to an hour depending on how dirty the engine may be. If the engine has clocked several hundred thousand kilometers, it is advised to change the ratio to 1:20 and leave the Motor Flush in 1000+ kilometers. After draining ZP-707 Motor Flush, treat large diesel engines with ZP-700 Engine Oil Treatment at a ratio of 1:20 every 10,000 miles (16,000 kilometers) or at standard oil change. Technical: Liquid - Dark Gray Color - 270∞ Flash Point - Reactivity Stable - Harmful if Ingested.